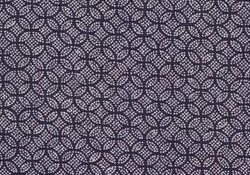 A pattern with sharkskin-like semicircle placed one on top of another. 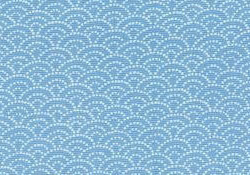 This is one of the oldest and characteristic komon patterns. Vertical and horizontal dotted pattern crisscrosses each other at right angles and at regular intervals. Hand-carved patterns give organic feel. Lines of dots are obliquely crossed. 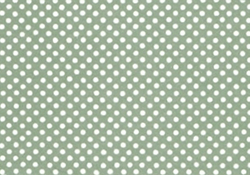 Because dots are placed regularly in such angles, this pattern suggests manners such as bowing graciously. 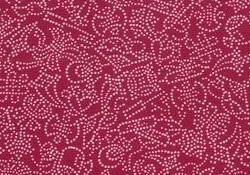 Popular authentic pattern of good fortune considered to bring good luck. Pattern of most beloved flower, attracting people of all ages and times. 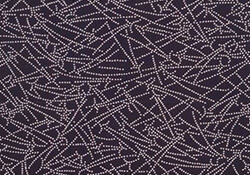 Authentic pattern introduced in Manyoshu, oldest existing collection of Japanese poetry. Popular pattern of concentric circles placed alternately, describing eternally upcoming waves. 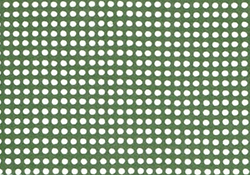 A sequential pattern in four directions considered good fortune because of the sequences. Pine stands severe cold and maintains its green, thus symbol of longevity and protection. 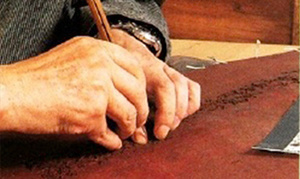 One of oldest techniques of carving Ise katagami paper, together with KIRIBORI. Stack of six pieces of paper are carved at once, their four sides bound with a twisted paper string. The patterns are carved by thrusting motions holding a knife with its blade edge forward and supporting it with the left thumb. Pictorial designs with curved lines and sharply-angled designs are created. 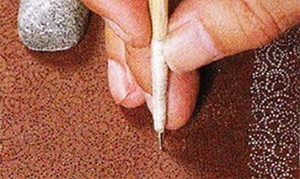 Small holes are carved using a small, needle-like, semicircular blade, held perpendicularly to the paper stencil. The blade is precisely rotated using left hand fingertips. 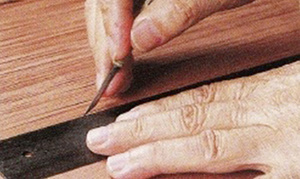 Three major patterns of Edo Komon, sahmeh, toshi, and gyogi, are all carved by using this technique, which require craftsmanship since the unevenness of carving is highly visible. 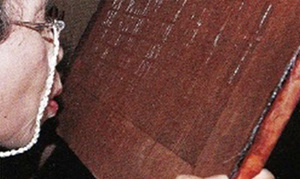 This techniques was actively used in the late Edo period. 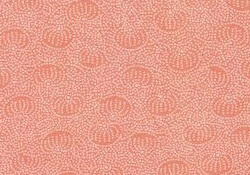 Patterns are carved by punching or stubbing, setting a cutting tool perpendicularly to the paper stencil. There are tools with various design blades, including cherry-blossoms, plums, circles, triangles, and so on. Mixing different kinds of tools creates orderly pattern. Usually carvers make their own blade tools. Unlike other carvings, SHIMABORI are created by pulling the blade toward the carver. 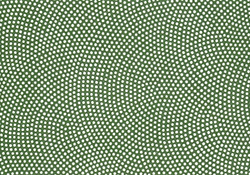 The pattern looks simple, but it is considered to be most difficult, since it requires such concentration and control. 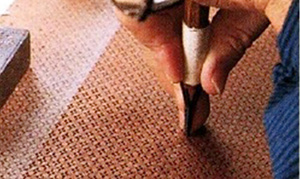 To create lines with the same feel, once started, carvers cannot leave for hours until he completes the work. It takes at least 10 years to be a full-fledged craftsman. 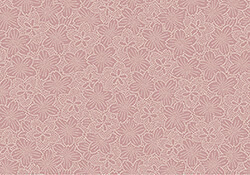 ITOIRE is a reinforcement method of paper stencils, used in times of need, since such extra-fine designs are carved on paper and will be used many times to dye fabric. Raw silk string is tucked between two pieces of paper, stretched vertically, horizontally and diagonally. The two papers are re-pasted quickly using persimmon tannin, and extra tannin is blown off.